Light + Love : The Surprise. 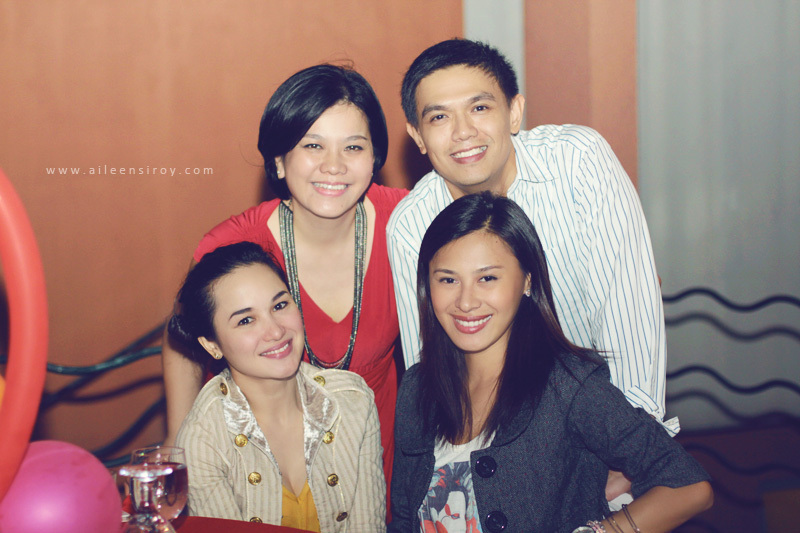 The birthday girl Aimi Jalandoni-Cabrera, my cousin Wadel Cabrera, Kathleen Hermosa, Dionne Monsanto. My cousin took his wife to the salon that afternoon so that, I assume, she will not bump into any of her family and friends arrive in their condominium building as they make their way to the pool deck for her birthday celebration. It was a surprise party after all. The party was wonderful and heartwarming, as every 40th birthday party should be. haaha nalingaw ko te..for sure they didn´t mind that u spoiled he bday suprise:) and the bday celebrant doesn´t look 40 at all. Julai: They just laughed, mostly, of my shocked expression. Haha.